For too long, cities have been thought of as environmental blackspots, with high levels of air and soil pollution, overcrowding, poor sanitation and growing waste disposal problems. This book takes a more positive attitude: cities can be made to work sustainably. Their high population density can work in the environment's favour if they can achieve efficient use of resources such as energy and water supplies, and improve transport and infrastructure. The best cities today are clean, resource efficient, green and pleasant, and not only act as cultural and entertainment centres, but also harbour great varieties of wildlife. Making Cities Work looks at the vital role which local authorities can - and must - play in safeguarding and developing our towns and cities. Their role is crucial, and the aim of the book is to make governments, international bodies and local authority associations aware of how potential environmental and social problems can be overcome, and what can be achieved. 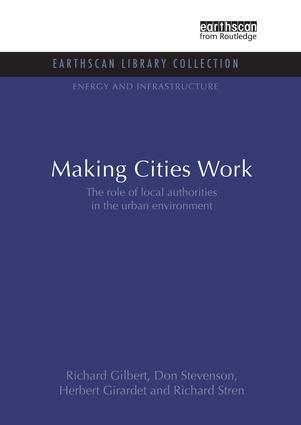 This book is being written by urban development experts, based on material supplied by the world's leading city associations. It is being edited by one of the world's most highly regarded cultural ecologists, and has been commissioned by UNHCS for the Habitat II conference. Clearly written, accessible, and fully illustrated throughout with photographs, figures and graphs, it is ideal for students, fascinating reading for the general public, and essential for those involved in local authorities, planning and development. Sustainable Cities, or Cities in a Sustainable World?